The sweater is well underway. The knitting has gone well, and there is great pleasure with stockinette in-the-round with soft, gorgeous yarn. After the ribbed hem, I have been alternating between two skeins every couple of rows are so. Approximately 13-inches of the body is now complete. In this photo, the pullover is pinned to the mannequin. Thus, it looks far more fitted than it actually is. There is an abundance of fabric on the backside. Honestly, I debated whether I was going to add them. I do not consider them all that functional, but they do add a design feature to an otherwise nondescript sea of stockinette. While I have added a number of different kinds of pockets to garments over the years, this was probably the easiest method. Both linings were knit prior to casting on for the body. Each lining left live stitches at the top. 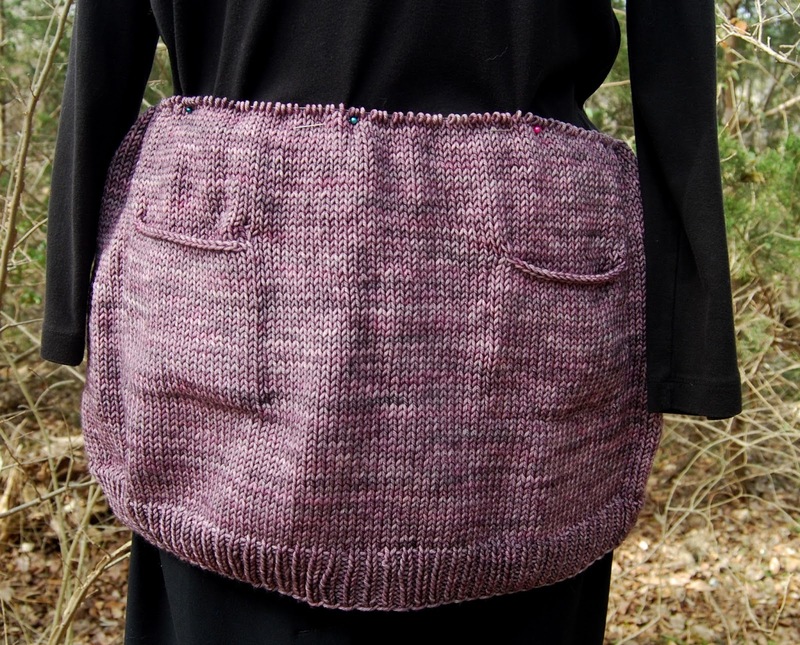 Once the body reached the point where the linings could be attached, the next round featured a bind off on the body for the fronts of the pockets. The next round added each of the linings (one for each pocket) where the previous stitches had been bound off. According to the instructions, the linings were to be sewn to the body, once the sweater was complete. As I do not mind finishing work, I usually weave my ends in as I go. Thus, once I took a break from knitting after I had added the pocket linings, I went ahead and sewed them down. Coco Knits has a perfect pictorial tutorial on how to do this!